Celebrate safely tonight! 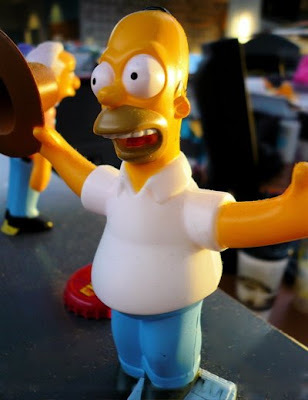 Homer suggests you include donuts. Luck was with everyone, though. 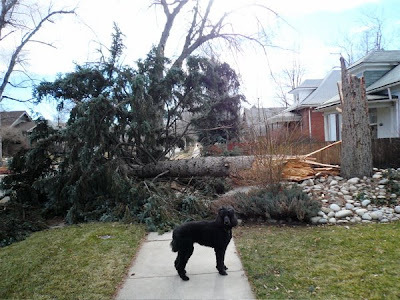 The only damage was to the street light wire and a neighboring tree. No cars or houses hit. When I was awakened at 4:30, I got up to stick a shim in one of the bedroom windows, which was rattling in its frame. I was also worried about the bee gum, but it stayed upright. I'm glad now that I had that tree taken down! It probably would've ended up in my living room. I learned firsthand the truth that bees don't like dark colors. When I first approached the hive wearing a black baseball cap, I quickly had some very unhappy guard bees circling me and chasing me back across the yard. When I switched to a light-colored cap, they mellowed out immediately. Some speculate that a dark shape looming over the hive means a hungry bear. Makes sense to me. "Did you hear about Roger?" 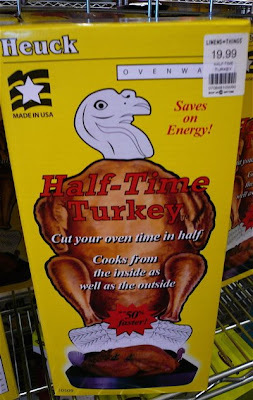 "He got canned after the boss saw that Half-Time Turkey package design." "Well, if you're going to make the turkey look like it's sitting on the pot with its pants around its ankles, you've gotta face the consequences." "Yeah, and it's too close to Thanksgiving to do over. We have to ship it as is." Mathilde E. Heuck, a renowned cook and homemaker, once traveled the world seeking ideas and recipes to improve the American kitchen. In 1922, she finally found the kind of brilliant idea she was looking for. Taking a few nails and a piece of string from her husband's tool box, Mathilde created the famous Heuck Turkey Lacer. This innovation made the preparation of delicious poultry dressing easier for cooks and homemakers everywhere. Millions of Turkey Lacers have been sold over the years, making it one of Heuck's most popular products. 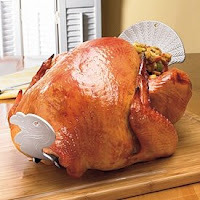 The company sells pretty much every turkey-cooking accessory you can think of, from turkey lifters to racks to basters to pop-up timers. All of them entirely sensible items. 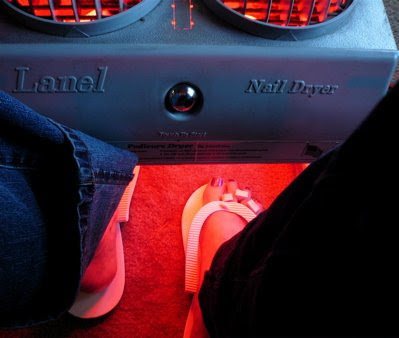 This gadget, though, makes me wonder. 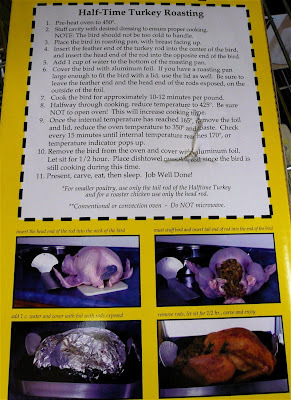 It's basically two strips of aluminum that you put inside the turkey to conduct heat and supposedly cook the bird faster. Do you think that really works? I can't find the Half-Time Turkey on Heuck's website and I suspect it's been discontinued. Or maybe it's just on hiatus for a package redesign. I hear Roger is getting help  and changing careers  after being found with his head in the oven. He was found abandoned as a kitten in a mountain neighborhood and adopted by my friends J&D. I was looking after him over Christmas. Surely you can think of a suitable caption! Oy. My kitchen lighting is just not great for photos at night. Or maybe it's me. Anyhoo. 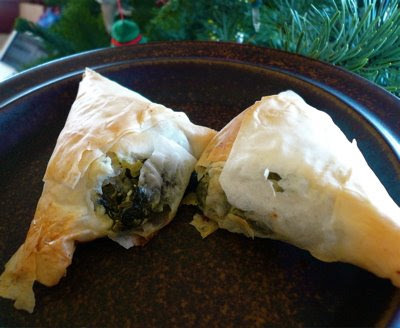 I had some phyllo and spinach left over from making spanakopita for Christmas Day. And I had a partial tub of cottage cheese I'd forgotten about. And half an onion that was getting a bit shriveled. And a couple of slices of Black Forest ham. So I made up a strudel. 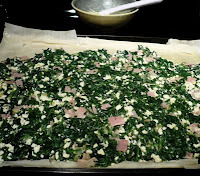 The onion got sauteed in butter with some garlic, and the spinach added, wilted, chopped and squeezed, and all of it added to the (drained) cottage cheese with a beaten egg and chopped ham and some salt and pepper and a little nutmeg. That was spread onto about five sheets of phyllo that had been laid out and buttered, then all rolled up and baked at 375 for 20 minutes, and another minute under the broiler to brown up on top. I wasn't really impressed with the phyllo's performance here (kinda soggy), but that filling turned out really good! 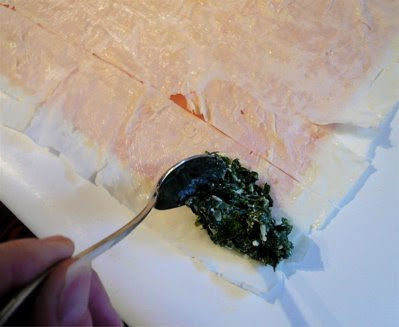 The creaminess of the cottage cheese is a nice foil for the spinach. I don't often cook with cottage cheese, but it seems to me that it can work in places where you might use ricotta. This treatment of spinach could just be tossed in a casserole and baked and served as a side dish, I think. Do you have any other ideas? Could the day have been any nicer? I thought it was supposed to snow, but it looks like that big ol' storm is stuck over the mountains. Down here in town, it was in the upper 40s and sunny. Warm enough for the bees to do a little housecleaning. Yes, that's an undertaker bee hauling a body out of the hive. A good sign, as it means the bees are healthy and strong enough to clean up after themselves. Their lifespan ranges from 6 weeks in summer to a few months in the winter, so it's inevitable that you will have some losses from age. I also would not be surprised if some bees froze to death last week. 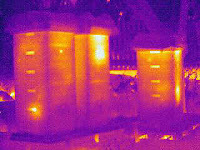 Bees don't heat the space they're in, rather, they heat their cluster. They pack themselves into a tight ball around the combs, solid on the outside and looser on the inside. 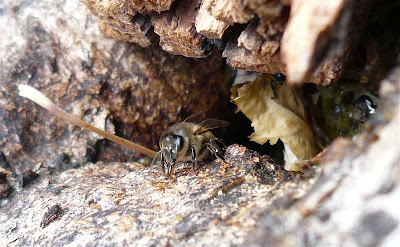 The bees vibrate their wing muscles to make warmth as the bees inside go about their business of eating, grooming and maintaining the brood comb. The inside temperature can be in the 90s! Bees on the edges will take honey there and pass it in. 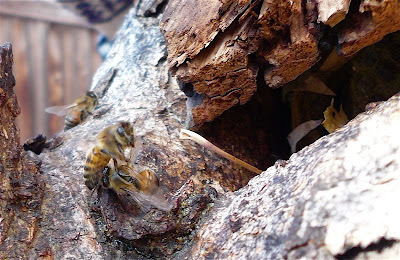 If the weather warms up a little, the whole cluster moves to access more honey. If the weather stays really cold for long, they can't move at all and may starve to death just inches from food. 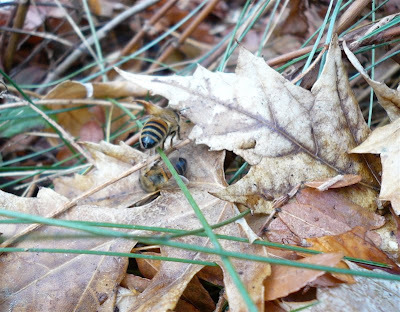 Bees on the outside of the cluster who get too cold will fall off and die. They may also freeze to death trying to get to honey that is just out of reach. I am still investigating feeding possibilities for this bunch, but not knowing the configuration of the hive makes it difficult. Apparently you can make solid sugar-based foods or get pollen patties (!). But it was a little cool to be luring anyone outside too much. Maybe on Monday, when we're supposed to get close to 60. 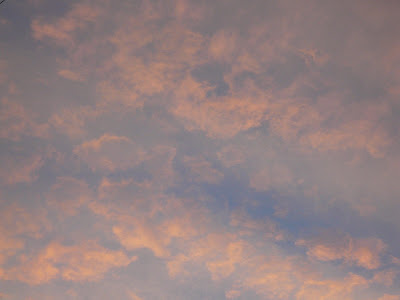 I've been using this photo of clouds at sunset as my desktop background. It looks like marbled paper, doesn't it? If you'd like to add it to your lineup of desktop themes, just click on it to get it full size and then right-click on it (or CTRL-click if you're on a Mac). Are you as full as I am? 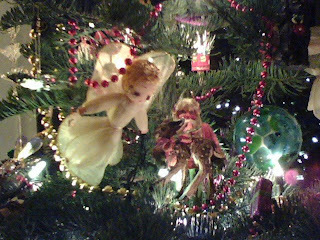 I left my camera at the kinfolk's, so you'll have to settle for a cellphone pic of my tree. Hope your day is wonderful! 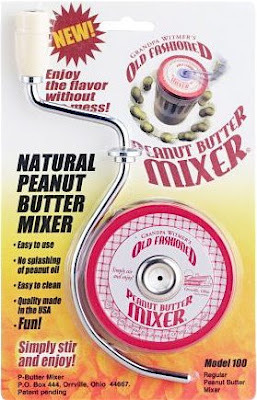 A loyal reader turned me on to one of this week's gadgets, Grandpa Witmer's Old-Fashioned Peanut Butter Mixer. 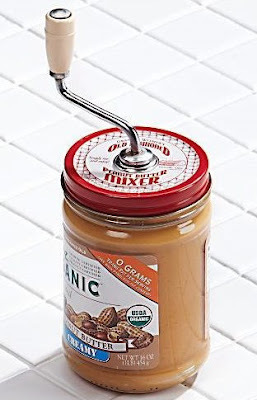 You replace your peanut butter jar lid with this thingamabob, which has an arm inside to stir up your natural peanut butter. You then pull up on the handle, which is cleaned by a gasket inside, and remove the lid to scoop out the peanuty paste. Well, OK, that's kind of cool, yes? It's made by Witmer Products of Orrville, Ohio. Now, as it turns out, Orrville is also the home of Smucker's. 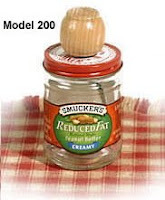 And this stirrer is designed to fit all the standard Smucker's jars, as well as other brands such as Laura Scudder and Adams. 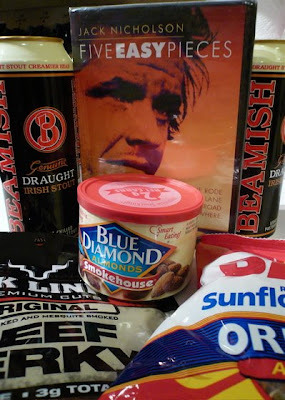 Those products, too, are owned by Smucker's. Hmmm. 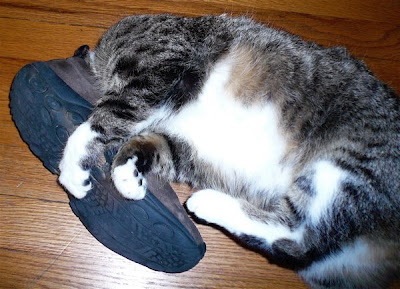 You have to wonder what the link is between the Witmers and the Smuckers. If you look on Amazon, you can find this product being marketed by several different companies, so it's up to you whether you want to pay $9 or $12 for it. If you go to the Witmer website, though, you can be sure to get the right kind for the right jar. Maybe what you really need is Model 200, or Model 50, instead of the Model 100 shown above. These knobby-type stirrers work better on the low-fat peanut butters, which tend to be on the stiff side. Consumer Reports did a comparison of peanut butters (and stirrers). Smucker's Natural and Smucker's Organic came out on top for best taste among creamy peanut butters. Testers liked the stirrers, too, but wouldn't pay $10 for one. Would you? But wait! There's more! If you decided to buy the stirrer at Amazon, you could also buy the Cuisipro Peanut Butter and Jelly Spreader on the left at $19.98 for both! Now, who the heck is going to shell out $10 for a color-coded PB&J spreader? Someone with serious OCD, maybe. Therapists could use it as a tool: "Bob, I want you to take this home and use the wrong sides." Aiieeeeee! 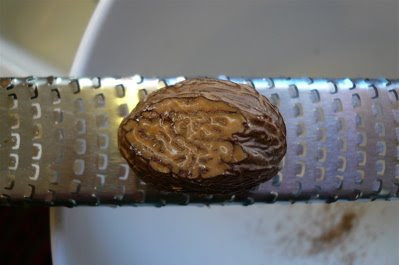 In conclusion, the spreader is silly, but I could see getting the Witmer stirrer for someone as a gift, if you knew they were really into natural peanut butter and could be sure of getting them the right size. If you're not interested in the Witmers' stirrer, you might choose from their eclectic and very brief list of other products: a sand auger for beach umbrellas, a plastic flap for your newspaper box or a retractable clothesline. I don't eat much peanut butter, but I'm tempted by the clothesline. How about you? Do you like the stirrer, the spreader or one of the other fine Witmer products? 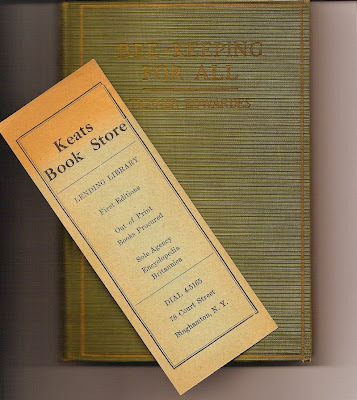 In the online bee forums, it's suggested that beginning beekeepers read an old book called "Bee-Keeping for All." I found a copy to order. Whoops! Turns out the book I wanted is by Abbé Warré and is available as a free pdf. What I got is this little gem by a fellow named Tickner Edwardes, written in 1922. Complete with vintage bookmark. It has some good information, though, including some of the things I will need to get. I am not sure how I'm going to come up with a bottle of cyanide, but I'll ask around. I'm sure Homeland Security will understand when I explain what it's for. 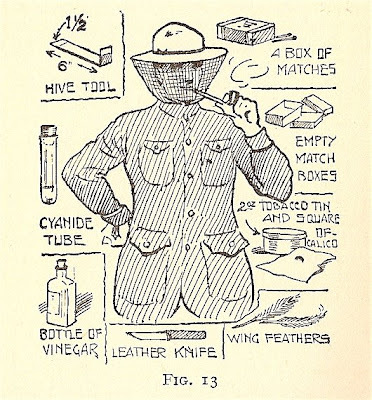 I'm tempted to take up pipe-smoking just so I can cut a dashing figure in my bee-veil. I'll be out by the hive, tickling my bees with those feathers. 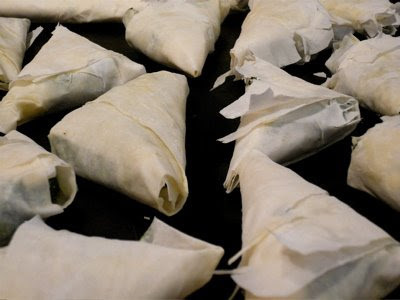 When you have some really fabulous feta cheese, spanakopita is a great way to showcase it. 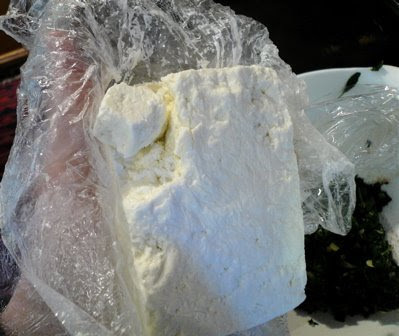 Last week I was at an Eastern European market, where I picked up some Bulgarian sheep feta. I meant to post about the market, but gosh, with the holidays and all, I've gotten behind! I'm sure you'll understand. Anyway, this feta is super-pungent and salty. It's too strong and salty for me to eat it by itself, which is saying something. 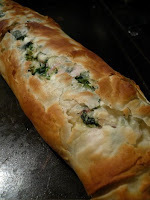 But I figured it would be quite yummy mixed with spinach and wrapped in phyllo. This is a free-form recipe. You'll need some phyllo dough. If it is frozen, it should be thawed in the fridge overnight. I had a jumbo bag of spinach from Costco. Maybe 2 pounds' worth. I sauteed half an onion, minced, and a clove of garlic, also minced, in butter, in a large stockpot. Then I added most of the bag of spinach and stirred it around a bit, covered the pot, lowered the heat and let the spinach wilt down for 10 minutes. I grated some fresh nutmeg into a bowl and added about a quarter-pound of feta. If it were a milder feta, I would use more of it. 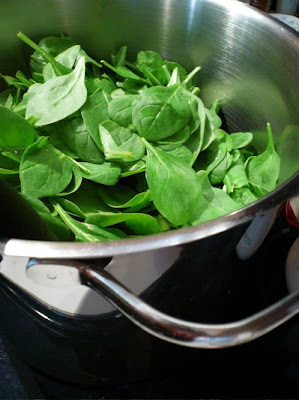 When the spinach was wilted, I spun it in the salad spinner, pressed it with a spatula and spun it again. My other option was to let the stuff cool and squeeze the excess juices out. But I'm impatient. 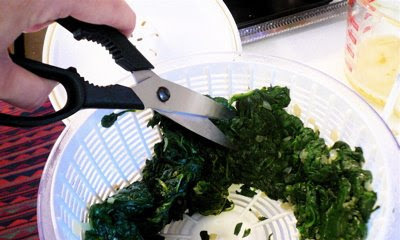 Another hint for the impatient: Scissors are an efficient way to "chop" cooked spinach in a bowl. 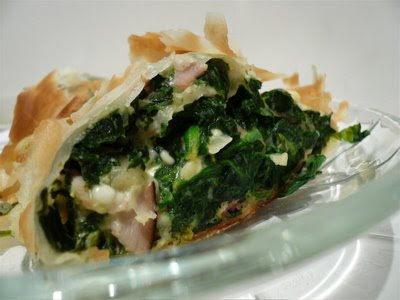 I mixed the spinach with the cheese and nutmeg, then prepared the phyllo. 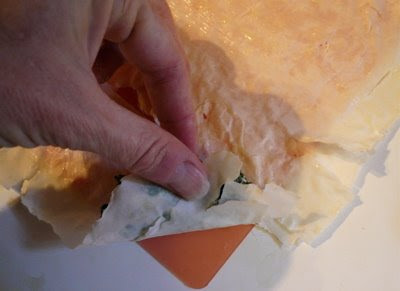 Keep the stack of phyllo sheets covered with a damp dish towel. Melt a stick of butter. 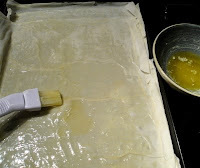 Lay out one sheet of phyllo and brush it with melted butter. Put another sheet on top and butter that. Cut the sheets in strips about 2 1/2 inches wide. Then you spoon and roll! You just roll it up in a triangle like a flag. I even made a little video. I'm kind of sloppy (again with that impatience!) but you get the idea. 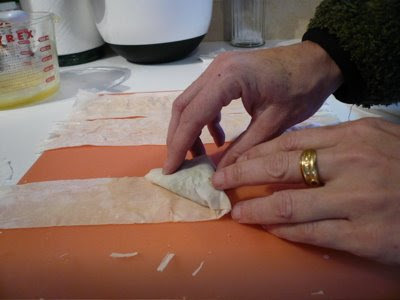 I was overly generous on the filling; I rolled three batches, or six sheets of phyllo, which fit on one baking sheet. You could use less filling and make them smaller, for appetizers. I brushed the tops with more butter and baked them for 25 minutes. I ran the broiler at the end for a minute to make them nice and golden on top. I was running late for work, so the final shot was hasty. And then I passed them all out to the cow-orkers and that was the end of them. Everyone said "Yum!" Let's say you have a cheap bookcase that you got at Target and assembled yourself. It's still in good shape, but you have no place to put it. 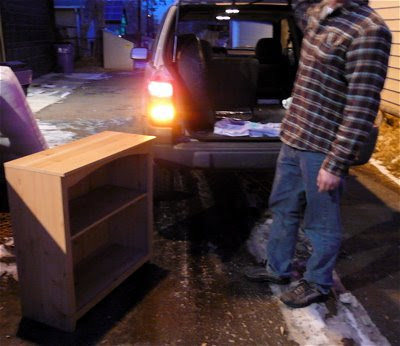 Through the magic of Craigslist, you can turn that bookcase into a pedicure! 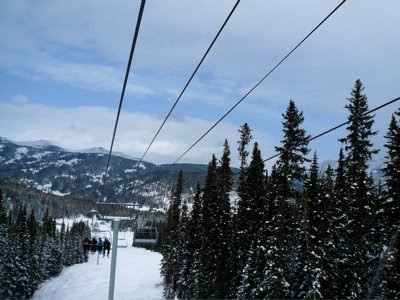 Copper Mountain is about an hour and 10 minutes from Denver. That's where I learned how to ski, so I have a soft spot for it. The skies stayed mostly gray, with tantalizing patches of blue in the distance. The video below makes it sound horribly windy, but it wasn't. 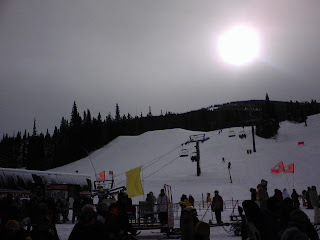 Had I known, I would've spoken louder ("It's a great day for skiing at Copper Mountain"). I was pretty well bundled up and stayed warm, but my legs are out of shape! 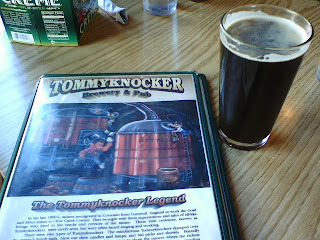 We just did a half-day, and stopped at Tommyknocker in Idaho Springs on the way home for some fabulous tomato-artichoke soup and a quesadilla. First ski day of the season for me. 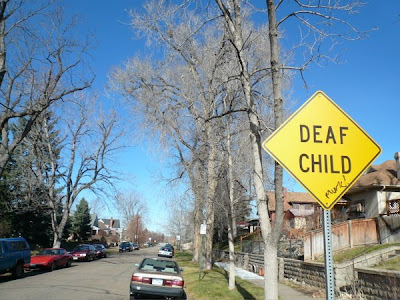 This "deaf child" sign has marked this block for the 10 years I've known it and maybe longer. How old is that "child" now? I asked a resident who happened to come out as I was passing. Turns out, there never was a child, really. The neighbors were frustrated by heavy trucks roaring at high speed up the street from a highway construction site. So one of them who has a deaf niece in Minneapolis who visits sometimes persuaded the city to put up the signs, in hopes that would get the truckers to slow down. And did it work? I asked. No, not really. I've been hearing good things about Mizuna for years, so it's a little surprising I hadn't eaten there before last night. On the other hand, it's a very pricey, special-occasion kind of place (at least on my budget). There's only so many of those I can afford in a year. We started by sharing a dish of Nantucket Bay scallops in parsley and caper brown butter, accompanied by fried artichokes on lemon aioli. The scallops were simply heavenly. 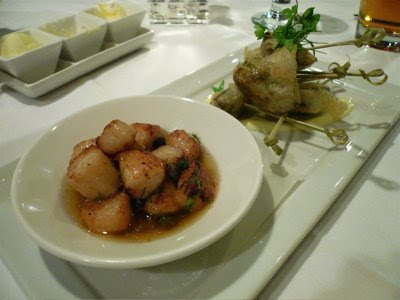 Smooth and creamy and scallop-y, just lightly crisped around the edges and tender inside. We mopped up the butter sauce with our bread. The fried baby artichokes were cleverly presented  quartered and skewered , and super-light, but I can't say they really tasted like anything but tempura batter. Maybe if I'd tasted them first; since the scallops were so distinctive they probably overwhelmed the much more subtle artichoke flavor. 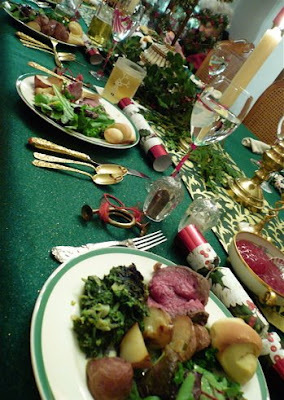 For the main course, steak knives were added to the table. Styled to look like pocket knives, they were attractive and distinctive. A closer look revealed them to be Laguioles, which are the ne plus ultra of knives. Reading food blogs introduced me to them, but I'd never seen them in person. That's me, geeking out over tableware. The Sergeant ordered the roasted Cervena venison loin, with crispy sweet potato cannelloni, roasted chestnuts and red wine choucroute. It was quite tasty! 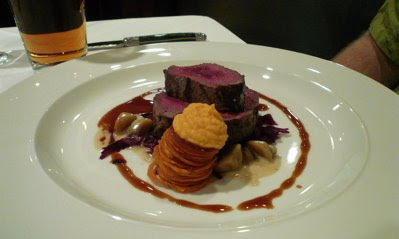 And I found it interesting to compare the taste and texture of the venison with my Colorado rack of lamb. 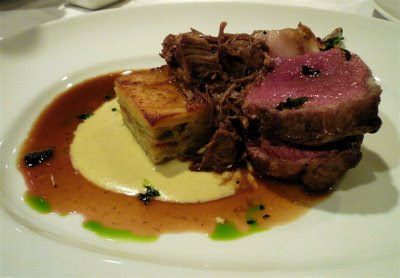 That was accompanied by a daube of lamb and an artichoke and potato gratin. I liked the lamb both ways. 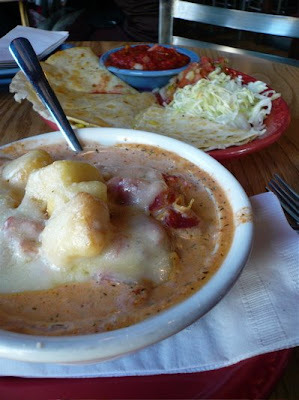 It was super-tender, and I picked up the bones to gnaw off every last little bit. Gauche? Pas du tout! The portions were generous, I thought, but not so large that you couldn't manage a bite or two of dessert. 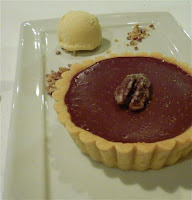 The Sergeant had Jivara chocolate pecan pie with Madeira ice cream. I didn't even taste it! 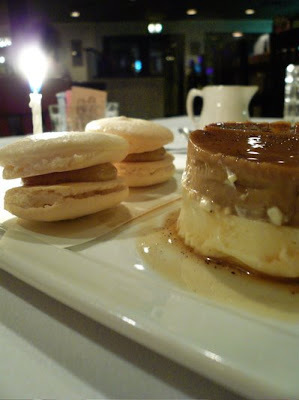 I had my hands full with my own cappuccino crème caramel and macarons. The crème caramel was brought to the table under an inverted coffee cup, which was then lifted to reveal it. Very sweet and yummy. I think it kept me awake for a while, too. And since it was my birthday, I got a candle to make a wish on. No, I won't tell you what I wished for, or it won't come true! But what I'm hoping is to go back one of these days and try the tasting menu. Office twin powers  activate! 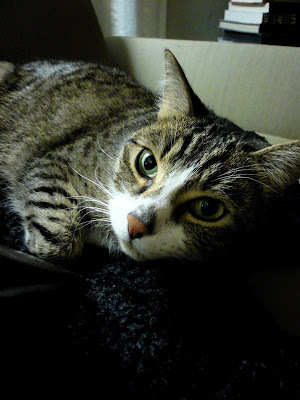 Bookstore kitties need a new home.Can you help?